Once your application has been processed, you will receive an e-mail with instructions on how to log into your Travel Agent Account on BransonOnTheWeb.com and begin earning commissions. Yes. There is no cost to you to become a Registered Travel Agent with BransonOnTheWeb.com. In fact, as a Registered Travel Agent, we will pay you commissions on purchases that you make on BransonOnTheWeb.com. Yes. However, purchases made on BransonOnTheWeb.com require payment in U.S. dollars, and all commission checks that you receive will be in U.S. dollars. How do I earn commissions on my purchases from BransonOnTheWeb.com? Once your Application has been accepted, you will be given access to log into the Travel Agent Control Panel on BransonOnTheWeb.com. While logged in to your account, any eligible purchases you make will earn commissions. You will not earn commissions on any purchases made on BransonOnTheWeb.com while not logged into your Registered Travel Agent account, and you will not earn commissions on any purchases made over the phone with a Branson Tourism Center agent. If you want to earn a commission for your BransonOnTheWeb.com or Branson Tourism Center order but you need assistance from a reservation agent, you can place your order over the phone with a Branson Tourism Center agent and add your commission separately. You will not earn a commission from BransonOnTheWeb.com or Branson Tourism Center for placing an order on the phone with an agent. However, you can request that the pricing information on your order confirmation be concealed, and you can add your own commission on top of the price charged by Branson Tourism Center. Yes. 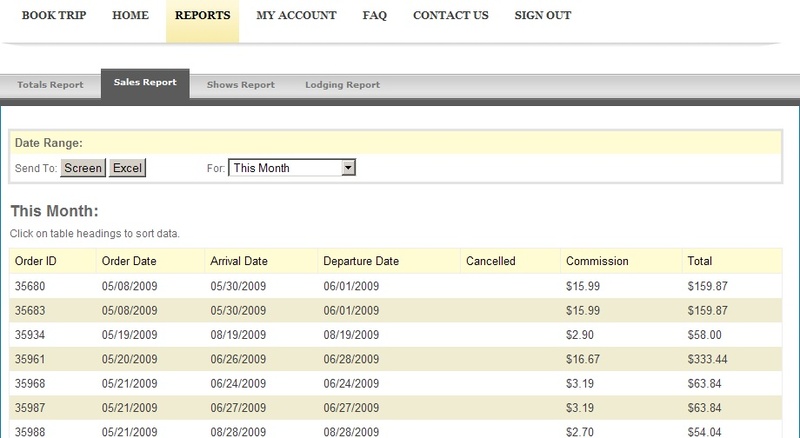 You can review your sales reports, statistics and other information by accessing the Travel Agent Control Pane at BransonOnTheWeb.com. After you are accepted into the Program, we will give you the necessary password to access the Travel Agent Control Panel, where you will be able to receive sales statistics, reports, and other information. This online service is provided to all members free of charge and is available 24 hours a day, 7 days a week. Simply go to BransonOnTheWeb.com/travelagents and click “Sign In.” Once logged in, navigate to the “Reports” tab to view and export detailed sales and commissions reports. No. All transactions will be processed through BransonOnTheWeb.com and Branson Tourism Center. The voucher system for show and attraction tickets and lodging that is used by BransonOnTheWeb.com and Branson Tourism Center allows us to sell tickets to virtually every show and attraction in Branson, as well as rooms at virtually every hotel in Branson. Customers will need to physically check in at the Branson Tourism Center building in order to pick up their welcome packet, which will include their itinerary, confirmation letter, and vouchers for lodging and show or attraction reservations. While picking up their welcome packet, a reservation agent will go through the itinerary with the customer, help them locate all of their events and lodging on a local map, and help better orient them to the Branson area while answering any questions that they may have.